I love a good chowder and haven’t had any in quite a while. So I threw together this New England inspired soup with an eye for making it light and healthy, but very tasty. I started with a medium onion chopped finely. This was sweated in a hot pan with a splash of olive oil and some salt and pepper. Once the onions began to turn translucent I threw in a good healthy dose of chopped garlic and a couple cups of finely diced cabbage along with two finely diced potatoes and a cup of frozen corn. After sautéing for a few minutes I added 3 cups of skim milk and 3 cups of water. I also seasoned the broth with some clam dashi powder to give it more of a seafood flavor. I also sprinkled in a tsp or so of Old Bay seasoning. I let this simmer for about 15 minutes until the vegetables were thoroughly cooked. At the end I added 1 can (~15 oz) of pink salmon, 8 oz of imitation crab meat, about 20 peeled raw shrimp and 6 oz of chopped up pollock filets. This was cooked for an additional 8-10 minutes just until the fish was cooked through. 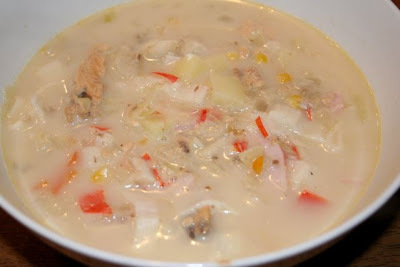 Even though the chowder was low fat with all the fish and seafood it had a wonderful texture and an even more wonderful hearty flavor. It was very satisfying.